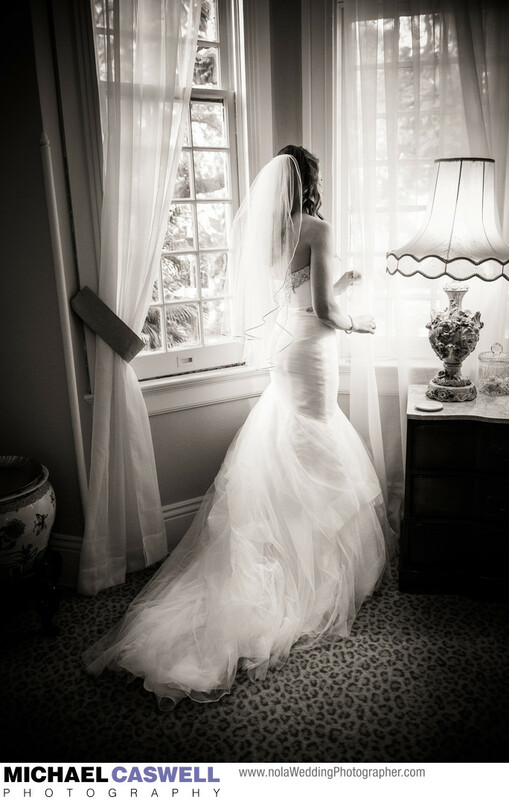 In this elegant natural light photograph, this lovely New Orleans bride peers out of the second floor window of the bridal suite at the Elms Mansion, overlooking the venue's garden and gazebo where her wedding ceremony was set to take place. Some brides arrive at The Elms already dressed and ready to go, but this venue also offers this very nice room for the bride to put her dress on and do any other final preparations that may be needed. It's also a great place to simply relax and catch your breath for a little while before the ceremony begins. In most cases, the groom and all the guests remain outside during this period, so it also provides an opportunity to get some shots of the bride on the beautiful staircase or elsewhere around the inside of the historic and gracious home. The Elms Mansion is located on St. Charles Avenue, and offers a very different feel and ambiance compared to French Quarter venues. One aspect of weddings here that I always love is the sound of streetcars occasionally rumbling by during the ceremony. It's a romantic and uniquely New Orleans thing that you won't find to the same degree at any other venue. Location: 3029 St Charles Ave, New Orleans, LA 70115.